BROOKLYN, OHIO – The last time the Mayfield Wildcats came to the Brooklyn Rec Center, they were blown out by the Brooklyn Hurricanes 8-2 on December 27th. 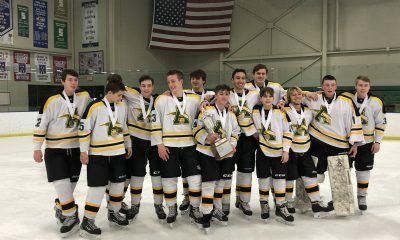 They were determined not to let that happen again in the first game of Baron Cup III on Tuesday afternoon. 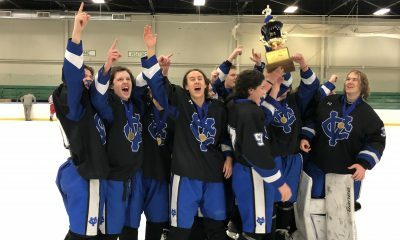 They needed just one shot in overtime, but sophomore forward Hunter Jeppe made it count, as he scored the game winning goal to lift the fourth-seeded Wildcats to a surprising 3-2 win over the Hurricanes. Getting to overtime was the hard part for Mayfield, as they trailed 1-0 and 2-1, but once they got to overtime they had a lot of confidence which carried over for the win. 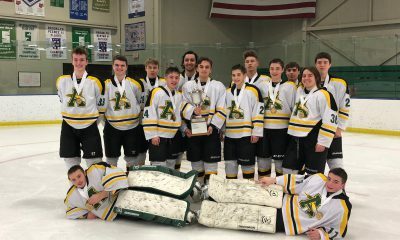 “That’s what we told the guys once we got to overtime, there’s no such thing as a bad shot, just get it to the net, stranger things will happen,” Mayfield coach Steve Bogas said. The loss for the Hurricanes came after they collected their Blue South trophy before the game. They scored just a minute in and looked like they were going to cruise to another win over the Wildcats, but Mayfield stepped up every time they were challenged by the Hurricanes. The Hurricanes beat Mayfield three times during the regular season, 8-2, 10-0 and 4-2, but Tuesday had a different feel for sure. “We were not that confident the first time we came into this building” Jeppe said. “We were more confident this time, and we knew we were going to win because of that game. 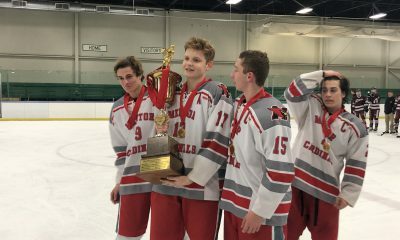 Mayfied goalie Michael Fink had a sensational game in net considering he allowed just one goal after the Hurricanes scored just sixty seconds into the contest. He turned away 40 shots on the night, including eight in overtime, three of which came after the Wildcats were called for a two-minute minor penalty for hooking, giving the Hurricanes a shot at the win. The Hurricanes in the contest wound up with a huge advantage in shots on goal 42 to 16, but in the end it didn’t matter as Jeppe, who scored the first goal to close it to a 2-1 game in the second period. The Hurricanes struck first as Aidan Supek got Brooklyn off to a quick start just a minute in, with the assist going to senior defender Josh Musarra to make it 1-0. It was the only goal of the period, one that was dominated for the most part by Brooklyn as they outshot the Wildcats 13-4. 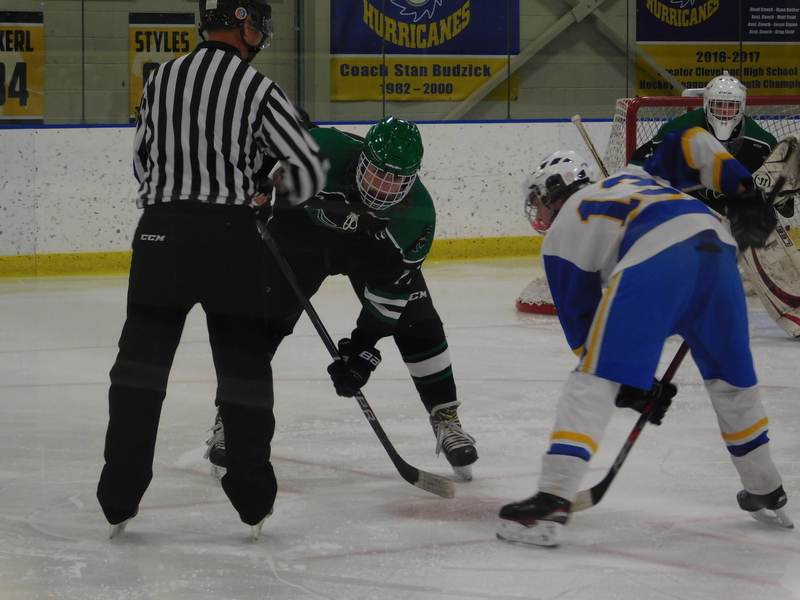 Brooklyn went up 2-0 in the second on a power play as senior Chad Schnear scored the goal after it hit off Fink and he was able to push the rebound past the Mayfield goalie. The assist on the power play goal went to senior Matt Crossman, and at the 8:21 mark of the second it was 2-0 and all was going the way of the Hurricanes. That’s when the momentum changed, as just 29 seconds later Jeppe got a ricochet in past Brooklyn goalie Jason Edmonds to close it to a 2-1 game. The assist on the goal went to junior forward Danny Popov. It was the last goal of the period, and again after two Brooklyn was dominating in the shots on goal, outshooting the Wildcats 26-9 after 30 minutes. The Wildcats knotted it up with 10:25 to play in the third, as after missing a back door opportunity, Ethan Macula was able to lit the lamp from the right slot to tie the game up. Junior Nick Maurer was on the assist of the Macula goal to make it an even game. 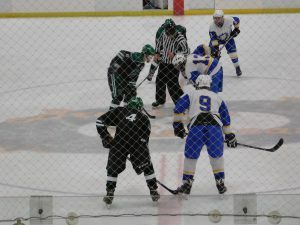 Both teams played it close to the vest the rest of the way in the third, and Brooklyn continued to have the lead in shots on goal with 10 in the third to six for Mayfield as the game went into overtime. Mayfield will move on as they will play at 3pm on Saturday against the winner of the Normandy and Aurora game which will be played Thursday at 4:30pm. Pingback: Day Three of the 47th Annual Baron Cup Begins This Afternoon in Brooklyn – Hear All 3 Games LIVE!